Replacement nozzles for the versatile DUROSEAL 600, Professional Cartridge and ‘Sausage’ Barrel Gun. 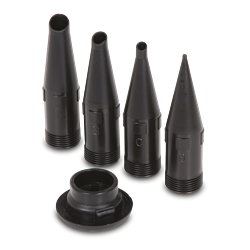 The nozzles are highly durable against compression, solvents and frequent use. Available in a 4 piece set, suitable for various applications. Use them for ‘sausages’, injectable resins and epoxy putties, cementitious products as well as elastomeric sealants etc.